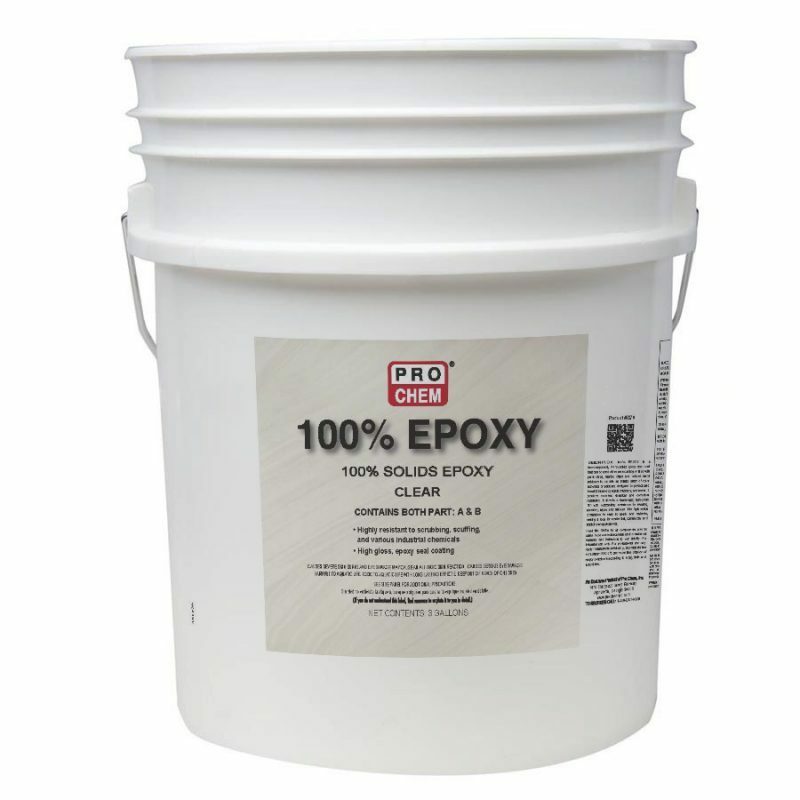 Epoxy Coating, 100% – 3 Gallon Kit | Pro Chem, Inc.
100% EPOXY is a two-component, 100% solids epoxy seal coat that can be used either as a coating or filled with aggregate to provide an endless array of color schemes or patterns. It is designed to protect and beautify interior concrete/masonry. It dries to a heavy-duty, high-gloss film with outstanding resistance to wearing, abrasion and chemicals. enough to start coating. The plastic sheet testing is also a good method to determine if any hydrostatic pressure problems exist that may later cause disbanding. Mixing: This product has a mix ratio of 9.0# Part A to 4.15# Part B. Standard packages are in premeasured kits and should be mixed as supplied in the kit. We highly recommend that the kits not be broken down unless suitable weighing equipment is available. After the two parts are combined, mix well with slow speed mixing equipment such as a jiffy mixer until the material is thoroughly mixed and streak free. After mixing, transfer the mixed material to another pail (the transfer pail) and again remix. The material in the transfer pail is now ready to be applied on the primed substrate. Improper mixing may result in product failure. Priming: A suitable primer should be used before applying this product. If a primer is not used, more porous substrates may cause outgassing and possible surface defects. conditions or over aggressive mixing causes air entrapment, then an air release roller tool should be used prior to the coating tacking off to remove the air entrapped in the coating. This product can be used with various colored sand in a broadcast system or other suitable aggregate can be used in conjunction with this product to achieve a variety of color and application patterns. When using as a broadcast binder, always evaluate performance parameters with a test area which is dependent on aggregate size and thickness, prior to application. Contact your representative for details as necessary. Recoat or Top Coating: If you opt to recoat or topcoat this product, you must first be sure that the coating has tacked off before recoating. Always remember that colder temperatures will require more cure time for the product before recoating or topcoating can commence. Before recoating or topcoating, check the coating to insure no epoxy blushes were developed (a whitish, greasy film or deglossing). If a blush is present, it must be removed prior to topcoating or recoating. Many epoxy coatings and urethanes are compatible for use as a topcoat for this product as well as multiple coats of this product. Floor Cleaning: Caution! Some cleaners may affect the color. Test each cleaner in a small area. If no ill effects are noted, you can continue to clean with the product and process tested. Restrictions: Restrict the use of the floor to light traffic and non-harsh chemicals until the coating is fully cured (see technical data under full cure). It is best to let the floor remain dry for the full cure cycle. Dependent on actual complete system application, surface may be slippery, especially when wet or contaminated; keep surface clean and dry.